Oh, this looks insane. Absolutely beautiful. I don’t know if I can wait six months to find out the outcome. 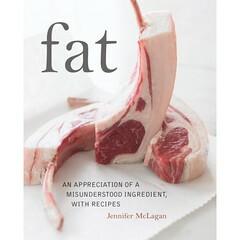 I’ve got a copy of Fat sitting on my desk right now, and am gearing up for a round of Bacon Baklava this weekend. Lardblogging really should be the new national sport. Looks like an excellent experiment. My only concern is that you it kind of looks like a lardo panini press. The blurb said marble vats. I couldn’t find an image of a marble concas online. 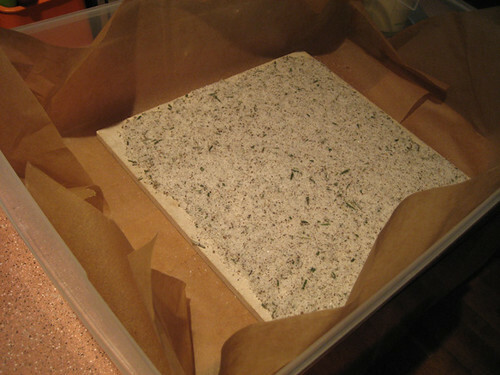 Plenty of nice pictures of lardo out there though. Was there a recommendation for a weight on top? I have about 25 pounds of frozen back fat and might have to give this a try. I noticed you skipped the pink salt. 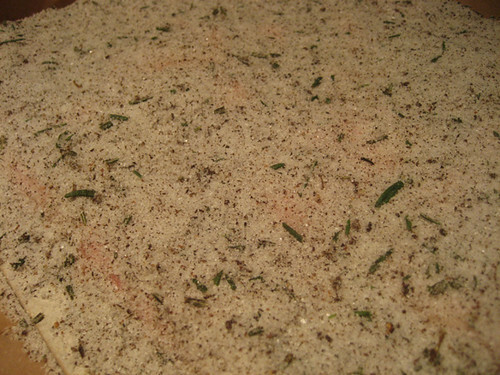 In then end did you like the guanciale without the pink salt better? It was undecided in the last post I read. skip the “you” in the second sentence. Brain cramp. I think the idea is that you pack it tightly into the conca, so I figure this is roughly the same. I just figured acquiring a marble vat of any sort was going to cost a lot more than two $3.99 tiles. Actually, the lardo never had the pink salt. I don’t know which guanciale I ever liked better, they both seem fine, I feel a little safer with the pink salt in something that has actual meat in it. I’m with you on the pink salt. There is definitely a feeling of safety that goes with it. In Charcuterie, they use some pink salt in the cure. They also use a weight on top, similar to your set up. I had remembered the pink salt, but forgot about the weight. Until tonight, I hard read about lardo but Charcuterie was the only place I had read about making it. I’d say you are correct in assuming importing one of these would cost more than 10 bucks. I guess if the conca is filled with slabs of fat, they will weigh themselves down. I checked on the condition of the lardo last night. 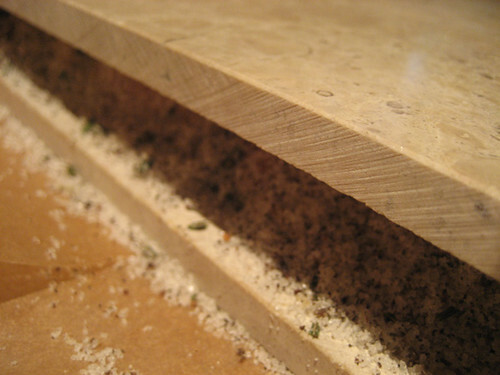 Not that you can see a whole lot, but if there’s any liquid at all being expressed, it’s quickly absorbed by the salt. You’re right, there was pink salt in the original batch, but I think given that there’s virtually no meat in these pieces, there should be no concern about spoilage on a level that the regular salt isn’t up to retarding. That’s how it’s made! I got some lardo from La Quercia ,Norwalk ,Iowa and it is a revelation. Have you ever made scrapple? It’s an old Pennsylvania Dutch dish that when it is done right makes the start of your day worth getting up for. 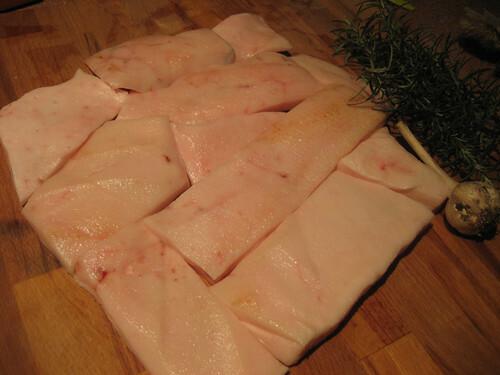 I am considering incorporating lardo in my scrapple recipe Oooooo!